EDIT: Jam Jar lounge has been renamed to Milli Vinilli. See Milli Vinilli’s website here. It’s exciting times at Clown HQ these days. We’re working on a little project that will hopefully come to fruition in the next few weeks, so stay tuned!! Unfortunately it’s meant that I haven’t been able to crank out as many blog posts as I would have liked, and this one will be a little more succinct than usual. After a simply sensational dinner at Monty’s, the following morning found us parched, and in need of a hot breakfast. 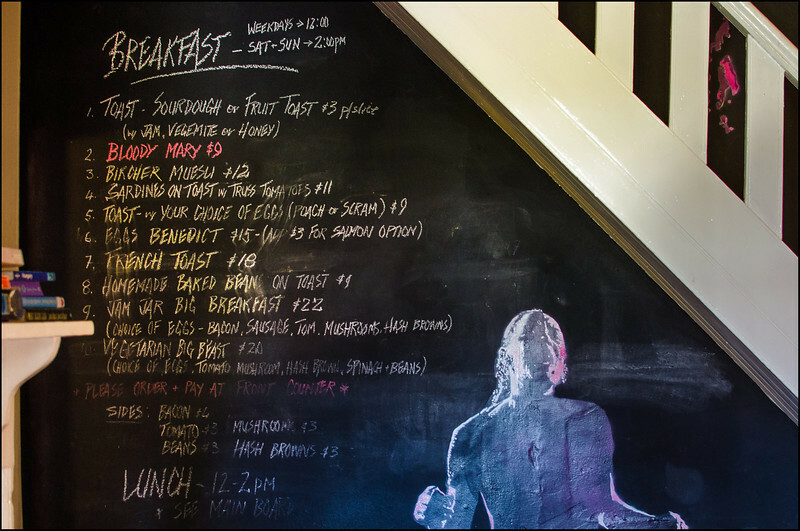 As Hampden Road was only a hop, skip and a hungover jump down the road, we thought we’d drop into one of Hobart’s favourite breakfast venues, Jam Jar Lounge Cafe. Our timing was perfect. Passing the giant menu drawn up on the wall we managed to secure ourselves a cosy little seat in the room out the back, and chilled out while watching the cafe swiftly start to fill with customers. Jam Jar menu…in sore need of a touch up! From the Rastafari garishly painted on the wall, to the quirky playing cards used as table numbers, to the art deco lamp shades, I could feel a rakish beard spontaneously sprouting from my chin and watched in horror as our trusty Mazda transformed itself into a chrome fixie before my very eyes! Someone pass me my horn rimmed glasses and soy latte before I start reciting my spoken word ode to the wonders of stove-pipe jeans!! With such an ultra-cool image I was expecting some oddities to be presented on the menu. Unfortunately it was quite uninspiring. Standard breakfast fare seemed to be the order of the day; bircher muesli, eggs on toast, big breakfast…are you serious? Despite the overwhelming sense of beige, one thing did catch my eye, and that was the French toast! A childhood favourite of mine, despite its simplicity it’s a dish I’ve very rarely found to be done well. 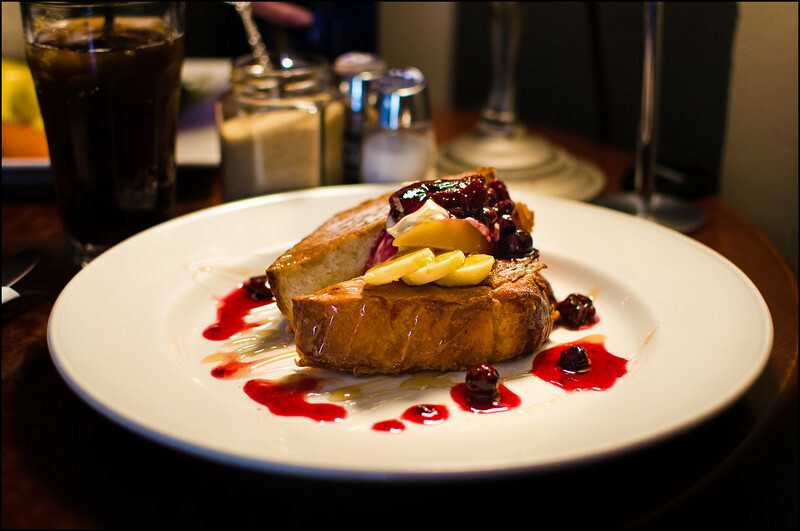 Soggy bread, hard bread, too thin, not enough syrup…not so at Jam Jar!! The bread was at least an inch thick, with the warm centre encased in a thin, slightly firm shell of delicious batter. Topped off with berries, banana slices and an ample drizzle of sweet syrup, this was one very tasty, and totally satisfying breakfast! 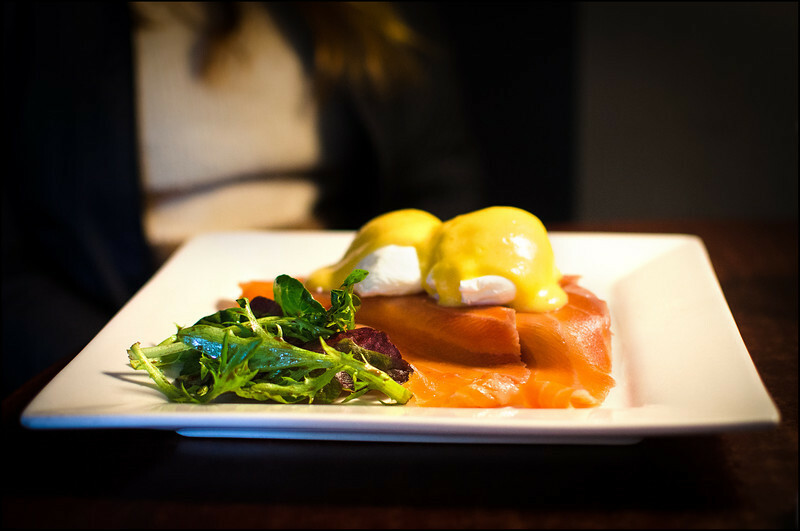 Karen, on the other hand, went for the Eggs Benedict with salmon. Personally I don’t understand the allure of Hollandaise sauce, and hence I steered clear. By all accounts the Eggs Benny was a solid meal, but not much more. The service was pretty reasonable throughout, but after we had watched the staff at work in their dealings with the various customers I got the distinct impression that they felt like they were doing us a favour, sullying their hands in service to the commoners. French toast with a side serve of condescension if you will. It wasn’t overbearing, but it introduced an ever so slightly discordant note to what had otherwise been a very enjoyable start to the morning. One interesting feature they do offer their diners, is the provision of a ‘dog friendly’ courtyard out the back. So for those that like to enjoy breakfast with their significant other and/or loyal pooch, this one’s a sure fire winner! As long as you aren’t looking for anything too innovative, Jam Jar should have something to please. The flavours were great and the quality of a high standard. I do think there are better breakfast options out there, including Environs located across the road, and Pilgrim, yet Jam Jar still manages to present itself as a warm and vibrant lounge cafe that will give you, and possibly your hound, a perfectly satisfying start to the day! Our only experience was much as you described. I chose the eggs as nothing inspired me and I don’t do sweet (well hardly ever). The husband ordered sardines because it would be his only opportunity to enjoy them seated at a table instead of outside with the tin immediately sealed with as much care as asbestos and consigned to the furthest bin (poor neighbour)! Even he was shocked when his smelly fish arrived, presented on the plate, beside the toast in the open TIN! We had the same impression about service being more a necessary procedure than part of a complete experience. The coffee was good but there are far too many wonderful eateries doing a far better job for us to consider going back for any other meals. Couldn’t agree more about Hollandaise too. I always ask for it on “the side” and nearly all goes back to the kitchen…just too rich. Sounds like we’re on the same page Janet! The sardines would have been my backup if the French toast hadn’t been available. From your description I’m glad that didn’t occur! As if you serve food out of a tin?!! Great photo of the eggs! Nice camera. Thank you very much! I’ve gone down the Nikon path and use a D7000.